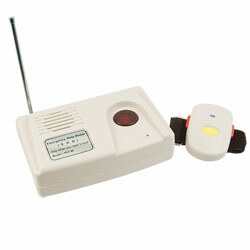 "Simply Push Buttons on Pendant to Call for Help"
Just push the pendant buttons and call for help! No matter what happens in your home (accident, fall, stroke, heart attack, burglary or other unwanted events), the all-new Help at Hand Emergency Telephone Dialier and personal alert system is designed to dial the telephone numbers you select and send your emergency message. You choose the persons to be called and you record the message they receive. Simply push the 2 red buttons on the wireless pendant to contact up to 5 pre-programmed numbers you choose to hear the message you record. Help at Hand dials the phone for you. Regardless of your age or disability, you can feel secure knowing you are never completely alone. Best of all, there are NO INSTALLATION OR SERVICE FEES.